When a Texas-based entrepreneur and art aficionado contacted DNA Art US about providing DNA art for all his family we were, naturally, very interested. Ideas were discussed and over time these ideas developed into a unique series of artworks that would be the centerpiece of his art collection. Each of the four pieces is a whopping 99 inches long and 16 inches wide. 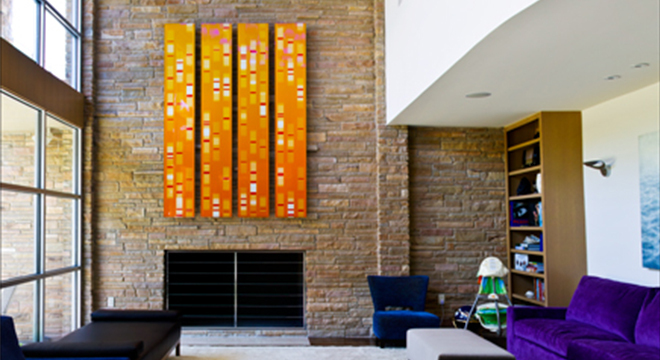 The incredible color reproduction of the Orange Aid color scheme ideally compliments the natural stone and the surrounding decor. The floor to ceiling windows created a lot of glare on our regular acrylic product; the solution museum quality non-glare acrylic. This exotic material reduces reflections to less than 15% while maintaining over 98% light transmission. All that plus it is only half the weight of glass. 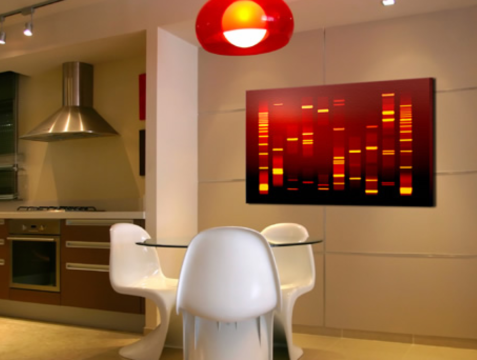 In common with all our range of acrylic and metal DNA art products, the wall mountings are hidden giving the impression of the artworks floating in space. DNA Art US offers the DNA Vision ® and DNA Vision ® Zoom ranges on high-quality acrylic, canvas and metal materials. Contact us today to discuss your DNA art requirements.